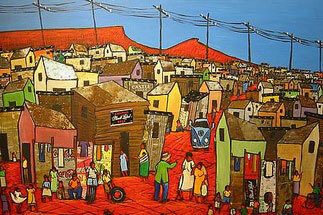 For those of you who might not know, Soweto is a large “township”, with a population of around 1.6 million people. It’s part of the Johannesburg Metro, but has its own, unique characteristics. Frontline recently completed a full retail census of all FMCG handling outlets in Soweto. We’ve counted, mapped and described several thousand outlets, and I’ve had the pleasure of mining the data for some insights. One of the key changes I have noticed is around “foreign” vs “local” ownership of the grocery channels in Soweto. Two segments, known as General Dealers and Spaza shops are very interesting to me, because they are numerous, and integral to FMCG consumption in South African townships like Soweto. When we did a count in 2012, foreign grocery store ownership was 35% vs 65% South African ownership, give or take a percentage point or two. By the end of last year, 2017, foreign ownership of grocery store has risen to 53% vs 47% South African. That’s a significant change, and especially so because foreign shop owners generally don’t do business in the same way that local owners do. The mechanism of FMCG business is evolving, as foreign business practices grow. In Soweto, having stock delivered to you vs having to go fetch it yourself, has a significant impact on competitiveness, because of its effect on logistics, costs, speed of response to stock-out, product availability, and so on. Delivery of stock is the aspiration, because of the advantage it bestows. At 34% vs 9% that’s a huge disparity between foreign and local owners, when it comes to delivery of stock. How come? The foreigners tend to belong to well-organized buying groups that work together to take better control of the entire mechanism of delivery and replenishment. At the same time they pool their financial resources to drive down costs by using stronger buying power to negotiate better prices. Without the buying groups, they might have been looking at direct delivery of around 7%, rather than 34%. Locals haven’t managed to put buying groups together. That’s a factor limiting their ability to compete. Meanwhile, the foreign shop-owners are growing their businesses. If you’re a manufacturer or distributor delivering into townships like Soweto, how are you responding to these sorts of changes? That’s what I love about using good quantitative data like this: you can make business decisions that count. If you’d like to know more about our Soweto outlet census, give us a call, and we’ll give you some insight. Frontline Research Group – we know Retail Census.